WASHINGTON, D.C. -- Three-fourths (75%) of Americans today think the United States has "a special responsibility to be the leading nation in world affairs," up from 66% in 2010. The surge is driven by Democrats, whose belief in this idea has increased from 61% eight years ago to 81% now. Since Donald Trump succeeded Barack Obama as president in 2017, he has drawn the ire of Democrats for his aggressive actions to reverse U.S. foreign policy on several fronts. Trump's "America First" approach to foreign policy has led to the withdrawal of the U.S. from multinational agreements signed during Obama's presidency and has caused conflict with other nations over trade and other issues. A November Gallup poll finds Democrats nearly unanimous (92%) in their disapproval of Trump's handling of foreign affairs. Republicans, who have a much more positive view (85% approval) in this month's poll of Trump's handling of foreign affairs, are slightly more likely now (79%) than in 2010 (73%) to say the U.S. should be the leading nation in world affairs, while support for the idea among independents has stayed about the same. Democrats are not the only group to show a major shift in attitudes. The percentage of liberals who believe the U.S. has a responsibility to lead has also climbed, from 61% eight years ago to 78% now. Americans aged 55 and older increased their support by 16 points, while those 35 to 54 increased theirs by seven points. In a related question that Gallup also asked in 2010, a solid majority of Americans continue to think the U.S. "has a unique character that makes it the greatest country in the world." Seventy-eight percent believe that now, as did 80% in 2010. Changes in the views of Democrats and Republicans since 2010 are minor, and the same is true for conservatives, moderates and liberals -- with Republicans and conservatives much more likely than Democrats or liberals to see the United States as the greatest country. However, the percentage of younger Americans who hold that view has dropped significantly. In 2010, 80% of those aged 18 to 34 said the United States was the greatest country, but that has dropped to 62% now, while the views of those 35 and older have changed little. Gallup asked Americans in 2010 whether they thought four recent presidents believe or believed the United States is the greatest country in the world, and it repeated the questions this month, adding Trump to the list. Just as in 2010, Americans today are most likely to say Ronald Reagan believed in the superiority of the United States (85%) and least likely to say Obama does (64%). Roughly two-thirds say Trump (68%) or Bill Clinton (69%) believes it, and 78% say George W. Bush does. In 2010, Americans were considering their country's role in international affairs through the eyes of a war-weary nation in the process of pulling out of the Iraq conflict -- a war that a majority thought should not have been fought. The public was mostly concerned about what the government could do to fix the recession-battered economy -- 69% identified some aspect of the economy as the nation's most important problem. Now, given the improvement in a number of economic measures, the proportion who say the nation's most important problem is economic has dwindled to 13%. Meanwhile, the past two years have seen foreign affairs thrust into the consciousness of Americans time and again through the actions of Trump and his administration. 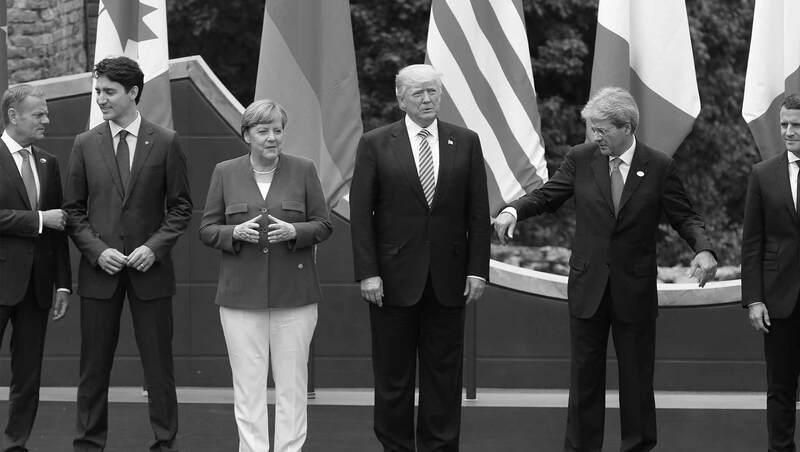 Trump's heavy-handed diplomacy with allies in Europe, Canada and Mexico, contrasted with his light-handed approach to North Korea, Saudi Arabia and Russia, has stirred controversy on a regular basis. The sheer volume of such newsworthy actions has given Americans -- especially Democrats upset by the changes Trump has made and alarmed by what he might do -- solid reasons for turning their attention outward to foreign affairs and the role of the United States in the world today.